Cliché, I know. But how do you tie together tragedy and food better than that phrase? It’s the ellipsis that gives hope, alluding to something more, an intention to find the silver lining. Last month I lost a dear friend and my best friend lost her husband. Ben was 26, full of generosity and zest for adventure. He complemented my friend Kate like yin and yang, ice cream and fudge, fish and tacos. Yep. I never knew about Ben’s obsession with cooking fish tacos. But he loved making them multiple nights a week, much to the chagrin of his wife. He just loved them so much and enjoyed pulling together the ingredients, mixing it in the pan and preparing his own masterpiece. God bless him because that was Kate’s only complaint in their marriage. Now, that’s perfected and true love. When I think of my favorite memories with Ben a lot of them have to do with his curiosity and almost childish nature around food. 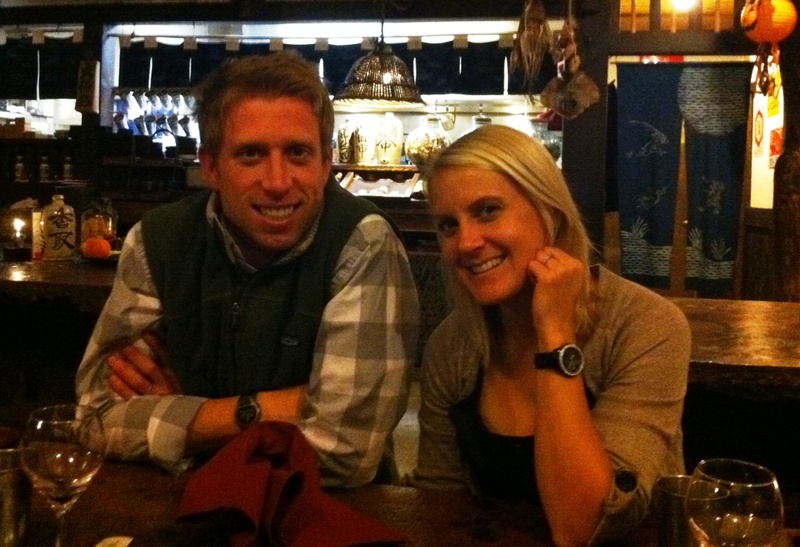 Dane and I took Ben and Kate to Domo, an authentic Japanese cultural center and restaurant in Denver. It’s in quite an unassuming location, so I could tell that Ben wasn’t sure what we had got him into. Domo is “country Japanese” cuisine and very authentic. It can be daunting to folks who usually go to trendy sushi spots or who get fast-noodles from Tokyo Joe’s. As we sat down we all took a few guesses and ordered what sounded adventurous but safe. The meal was first served via five or so plates, “family style,” of vegetables, fish and meat. Everything fresh, everything pretty foreign to us. 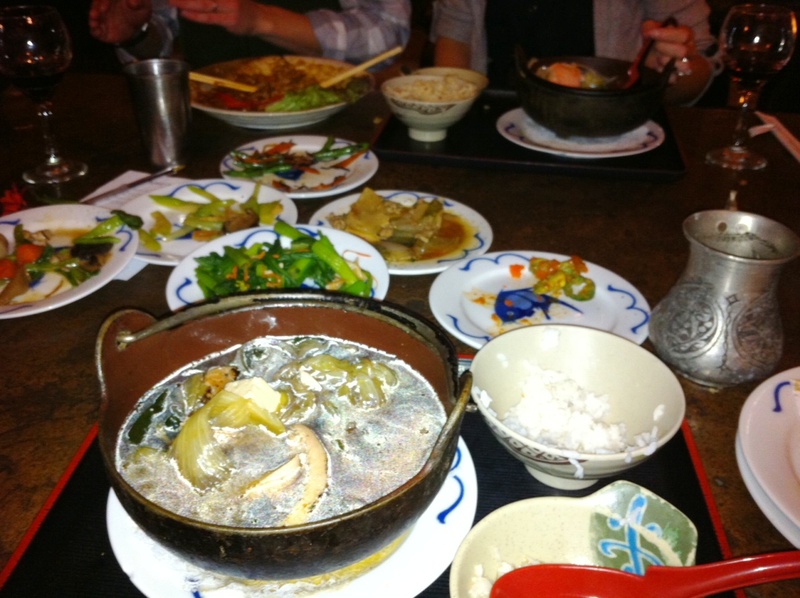 For our dinner, a couple of us chose “Nabemono,” a popular Japanese country dish. Domo says: Traditionally, farmers, fishermen and mountain men gathered what fresh ingredients were readily available for the day and cooked them together in a large pot for a convenient meal hearty enough to feed an entire family. Kind of like the Italian dish cioppino. The nabemono was served in an individual cauldron of sorts and steamed of soy, fish, meat and noodles. Reflecting back, I am noticing how Ben’s face lit up nearly at each bite. It was like a child finding a big snow bank, at every jump came elation. It was like that many times with Ben, as if that singular bite of food was the best he had ever tasted. So a lesson to my readers, the few you may be, take the hard times, the downtrodden days and your bad moods and make happiness out of it. Life is too short. Yep, another cliché, but I want to repeat it every time I worry about something insignificant. Life is uncontrollably too short. Enjoy your family, be sure they know it. Enjoy what you do right now, because it disappears so quickly. Enjoy your friends, share with them why you appreciate their friendship. And eat fish tacos, even if it irks your beautiful, strong and forgiving wife. What a nice story to honor your friend!